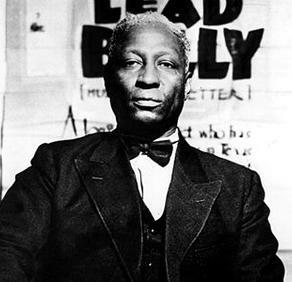 Huddie Ledbetter, better known as "Lead Belly," was born in the late 1880s (the date is stated as 1885 and 1889) in a country setting in northwest Louisiana. He attended school in Texas until around age 13, playing in a school band, and then worked the land with his father. He began learning how to play musical instruments as a youth and eventually focused on the guitar, performing as a teenager at local dances. At age 16, he headed out across the Deep South, settling in Shreveport, Louisiana, for two years, where he supported himself as a musician. Around 1912, now living in Dallas with his new wife, Ledbetter met Blind Lemon Jefferson, an accomplished street musician, and the pair began playing together. It was at this point that Ledbetter concentrated on what would become his signature instrument: the 12-string guitar. He is best remembered for songs such as "Goodnight, Irene," "Rock Island Line," "The Midnight Special" and "Cotton Fields". 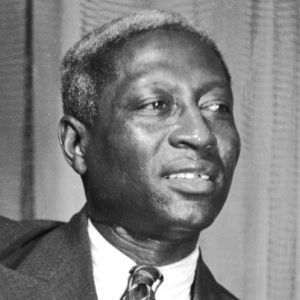 Huddie Ledbetter, better known to the music world as “Lead Belly” was born 20th January 1889, in Mooringsport, Louisiana (near Shreveport). Lead Belly was the only child of Wesley and Sally Ledbetter. Lead Belly first tried his hand at playing music when he was only two years old. As a young man he was introduced to the guitar by his Uncle Terrell Ledbetter and from that moment on he was electrified by the guitar. He mastered that instrument and just about any instrument he laid his hands on. He learned to play the accordion, mandolin and piano which gave hime a wide knowledge of various musical instruments and rhythm. It has been said that one day Lead Belly witnessed a Mexican guitarist playing the twelve string guitar which struck his interest in mastering the unusal instrument. He died in New York on 6th December 1949. 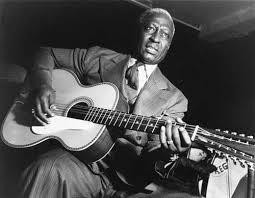 Huddie Ledbetter, better known to the music world as “Lead Belly” was from Mooringsport, Louisiana. and was accomplished musician. He could play the guitar, the accordion, mandolin and piano. His music still has a great influence on some of the greatest artists of today. 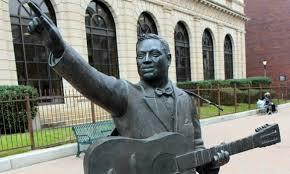 There is a statue of him on Texas Street in downtown Shreveport, Louisiana. He was inducted into the Rock and Roll Hall of Fame in 1988. 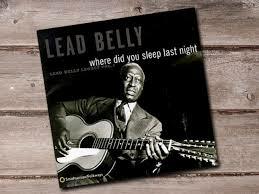 Some records and bill-boards appeared with his name spelt as Leadbelly but he wrote it "Lead Belly". 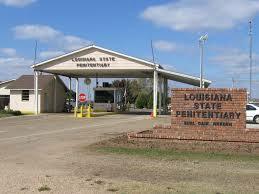 Lead Belly sang "Christmas Is A-Comin' (Chicken Crows at Midnight)" and other songs for the Louisiana State Penitentiary governor at Angola prison and gained his release.